The East coast of Florida offers up golden sands, navigable, calm inland waterways and the warm Atlantic Ocean. It has been attracting Canadian snowbirds for decades, initially to Miami, Ft. Lauderdale, Boca Raton and West Palm Beach, which were the winter homes of many prominent American families for the past 100 years and more. More recently, many parts of the East coast have been developed to accommodate the growing numbers of Canadian and American snowbirds seeking some winter warmth, as well as the large numbers of people moving to Florida year round. If you’re looking for a place to spend the winter, here are some of the best known areas, but there are many other communities along Florida’s Atlantic coast that are also popular with snowbirds. Flying there: You’ll find several direct flights from Canada, as well as ample airports to choose from along Florida’s East coast, starting with Miami and Ft. Lauderdale airports in the south. Then there’s West Palm Beach airport that serves the Palm Beaches, West Palm Beach, Boca Raton, New Smyrna Beach and even Daytona Beach. New Smyrna and Daytona can also be accessed from Orlando airport. Further north, you’ll find Jacksonville Airport close to the Palm Coast, St. Augustine and Jacksonville. Miami is a large port city at the southern tip of Florida’s Atlantic coast that has been the winter home to many Canadian snowbirds for decades. The city also has a thriving Cuban population which gives it a very Latin flair that extends beyond Little Havana to the music and cuisine of the resorts and restaurants of Miami Beach and the trendy South Beach Art Deco district. Miami is the home port of several cruise lines and watching these large floating cities come and go is a favourite local pastime. And if you want to take a cruise as part of your winter getaway, Miami is a great departure point, offering numerous options, frequent departures and reasonable prices. Home to several sports teams, snowbirds can enjoy baseball, basketball and football, depending on the time of year. The city is known for its restaurant scene, vibrant arts community, Latin music and fabulous beaches. A boater’s paradise with its proximity to the inland waterways, watersports of all kinds are available -- and Miami offers great golf courses too. Just south of Miami, the laid-back Florida Keys are connected by the Overseas Highway’s 42 bridges — including one that’s almost seven miles long — over the aquamarine Atlantic Ocean, Florida Bay and the Gulf of Mexico—a spectacular drive. Nearly 400,000 Canadians visited the Florida Keys in 2015 - many of them snowbirds - and Canada remains the Keys’ top international visitor market. The Keys are divided into five regions: Key Largo, Islamorada, Marathon, Big Pine & the Lower Keys, and Key West. Each has its own flavor, attractions and historic museums, flora and fauna, fishing, diving and watersports; boutique shopping and seafood restaurants. 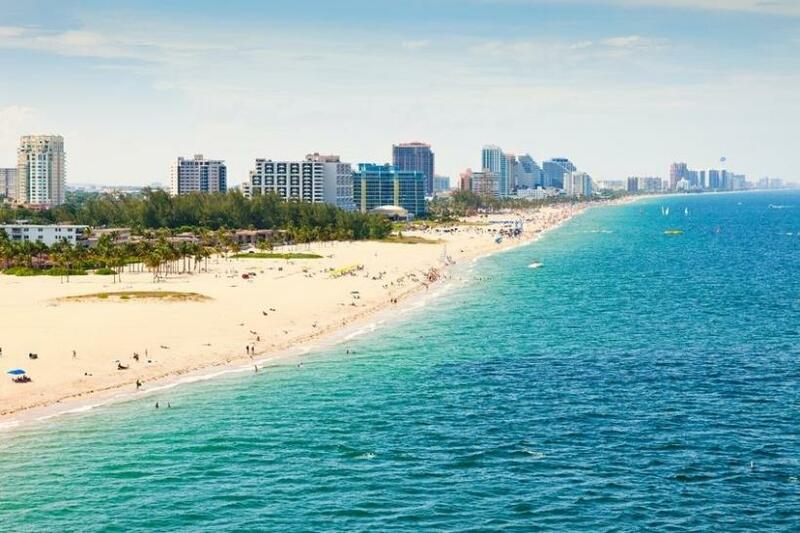 Ft. Lauderdale lies just to the north of Miami and is a popular snowbird destination, along with its adjacent beach neighbourhoods of Hollywood, Dania, Hallandale, Pompano Beach and Deerfield Beach. Florida’s Hollywood Beach and Hallandale have been a top winter destination for Canadian snowbirds for many years. Many of the local resorts, hotels and apartments are even tri-lingual, catering to French Canadian snowbirds too. Ft. Lauderdale is a city of canals, ideal for keeping your boat moored behind your condo or winter home. Famous for its beautiful beaches, Ft. Lauderdale visitors love strolling on Las Olas Boulevard and in the historic district. Boating, watersports, kayaking, shopping, golf, everglades tours, gondola rides and the South Florida Symphony Orchestra are among the many activities Ft. Lauderdale offers to keep snowbirds busy. Up the coast from Fort Lauderdale, you’ll find the upscale areas of Palm Beach, located on an island, neighbouring West Palm Beach on the mainland and Boca Raton. All three have been host to some of America’s wealthiest families during the winter months, with visitors admiring the mansions and the luxury shopping on Worth Avenue. The Flagler Museum is a must and there are countless fine dining options, art galleries and boutiques in the area, as well as many top golf courses and beautiful beaches. Nearby Wellington hosts equestrian events in the winter with some of North America’s top riders competing in show jumping events as well as polo. Snowbirds may struggle to find a lot of affordable accommodation options in these upscale enclaves, but you’ll find more affordable rentals in nearby Lake Worth, Jupiter Beach and Delray Beach, as well as lots of snowbirds. And for baseball fans, Jupiter Beach is home to the Miami Marlins and the St. Louis Cardinals during spring training. New Smyrna Beach has a very laid-back feel --- perhaps the most laid back on the East Coast – it attracts lots of Canadians in the winter and has some excellent rental options on or near the beach – which is a drive-on beach, incidentally, like Daytona. There are lots of cafes, bars, restaurants and shops, as well as a bustling arts community. New Smyrna Beach has been named to National Geographic’s list of the World’s 20 Best Surf Towns. The area is close to the Canaveral National Seashore, with vast stretches of undeveloped, natural landscapes to explore. Last year, the Daytona Beach area had 170,000 Canadian visitors. Snowbirds are drawn to Daytona Beach for its pristine beaches along 23 miles of Atlantic Ocean coastline. The area is known as the Festival Capital of Florida, and its legendary golf courses, shopping and restaurant scene provide lots to do in the winter months. Daytona Beach is also well positioned to explore nearby New Smyrna Beach and DeLand as well as daytrips to Orlando, St. Augustine, and the Kennedy Space Center. Visitors are discovering a new Daytona Beach – an exciting chapter in the destination’s history showcasing its racing heritage, idyllic East Coast oceanfront and impressive arts affiliation –leading to Daytona Beach being named a USA TODAY Best Florida Attraction in the Best Readers’ Choice awards. The more recently developed Palm Coast, with its wonderful nature preserves, is a long stretch of beaches with planned golf communities and condominiums alongside traditional homes, located between St. Augustine and Daytona Beach, on the Intracoastal Waterway. It attracts many snowbirds in the winter. Marshlands and estuaries play host to rare species of birds along Florida’s Great Birding Trail, and the local waters are home to dolphins and manatees. Historic St. Augustine is close to Palm Coast and is the oldest city in the United States, founded in 1565 by the Spanish. The city is known for its Spanish colonial architecture, lovely St. Augustine Beach and Crescent Beach. Nearby Anastasia State Park is a protected wildlife sanctuary. Visitors can explore the Castillo de San Marcos is a 17th-century Spanish stone fortress with views of the St. Augustine Inlet. Jacksonville is the largest city in the state of Florida and has the 12th largest population of any city in the continental U.S. But don’t let that put you off…it has beautiful beaches and a wide range of accommodations for snowbirds, not to mention restaurants, shopping, museums and a lively performing arts scene. There are many excellent golf courses in the area including TPC Sawgrass in Ponte Vedra, where the PGA Players Championship is held every year. Jacksonville Beache and Neptune Beach offer great walks, swimming, kayaking and surfing.